Designed with patented Spring-Action Rocking Technology, the GCI Outdoor FirePit Rocker camp chair delivers a smooth rocking action while you enjoy your favorite outdoor activity. The FirePit Rocker features padded arm rests, built-in beverage holder and a convenient carry handle. Folding a camp chair open and closed has never been easier or safer with GCI Outdoors patented EAZY-FOLD Technology. The FirePit Rocker is constructed of lightweight and sturdy powder-coated steel that supports up to 250 pounds. Each chair weighs 12.1 pounds. Measures 24 x 25 x 34.8 inches when open and 25 x 4.9 x 34.8 inches when folded. The GCI FirePit Rocker folding camp chair is ideal for any outdoor activity such as camping, tailgating, fishing and watching sports. Limited lifetime warranty. In GCI Outdoor terms, pico (pronounced pee-koe) means small. 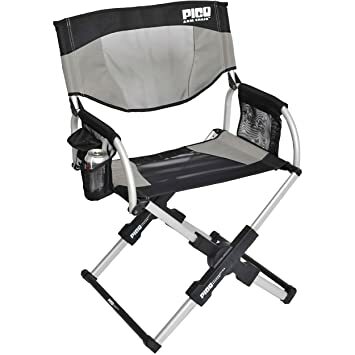 With the PICO Telescoping System, the PICO Arm Chair folds down to 1/16th of its size about the size of a laptop case which means it can easily be stuffed into a hatchback or trunk. Those who choose to carry the PICO Arm chair over the shoulder will enjoy the stylish, self-contained carry bag, padded shoulder strap pad and lightweight 9 lbs. After quick assembly, the carry bag doubles as the Chair Back Storage Caddy, with ample space for magazines, books, a sweater, a beverage, sunglasses and more. 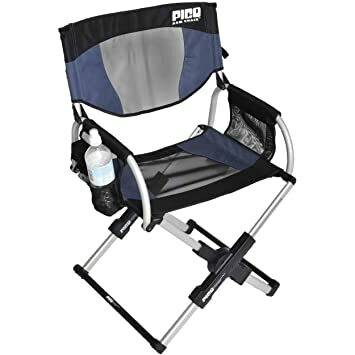 In addition to the Chair Back Storage Caddy, the PICO Arm Chair includes a mesh side storage pocket, a media pocket and a mesh side beverage holder. Lightweight yet sturdy powder-coated aluminum and steel support up to 250 lbs. Stay cool and comfortable with 600 denier polyester and breathable nylon mesh seat and seat back. Measures 17 x 22 x 34 when open and 20 x 3.75 x 12 when folded. Ideal for camping, RVing, fishing, and watching sports. Scratch-free nylon-coated feet also makes the PICO Arm Chair an affordable option for use indoors as extra, hide-away seating or dorm/apartment living. 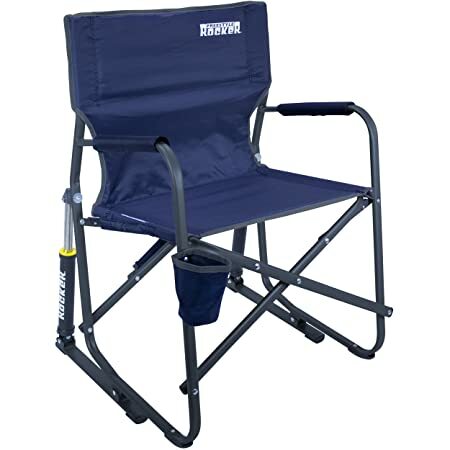 Designed with patented Spring-Action Rocking Technology, the GCI Outdoor Freestyle Rocker camp chair delivers a smooth rocking action while you enjoy your favorite outdoor activity. The Freestyle Rocker features padded arm rests, built-in beverage holder and a convenient carry handle. 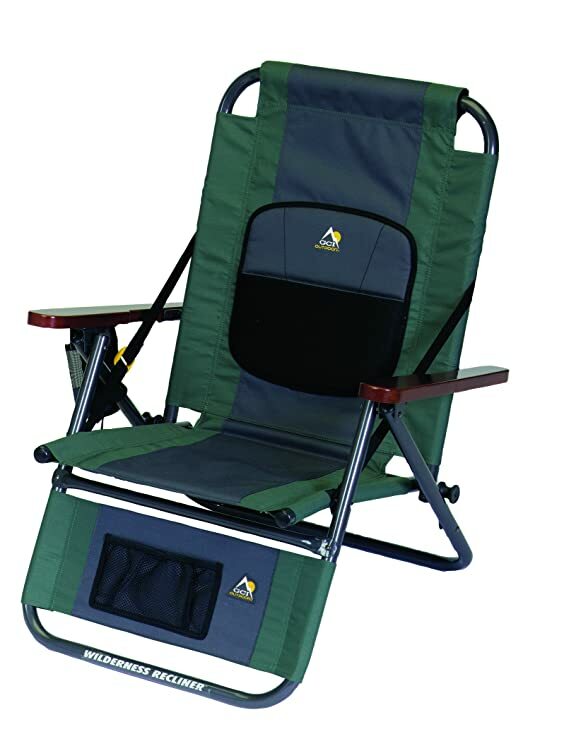 Folding a camp chair open and closed has never been easier or safer with GCI Outdoors patented EAZY-FOLD Technology. The Freestyle Rocker is constructed of lightweight and sturdy powder-coated steel that supports up to 250 pounds and has a seat height of 19.7 inches. Each chair weighs 12.1 pounds. Measures 24 x 25 x 34.8 inches when open and 25 x 4.9 x 34.8 inches when folded. 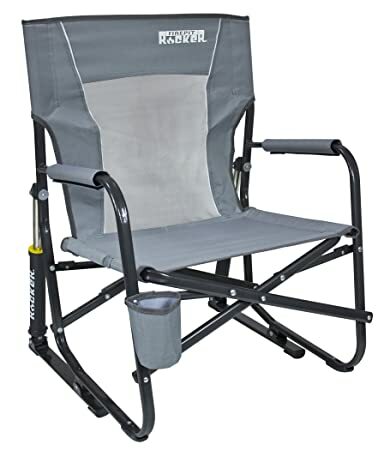 The GCI Freestyle Rocker folding camp chair is ideal for any outdoor activity such as camping, tailgating, fishing and watching sports. Limited lifetime warranty. 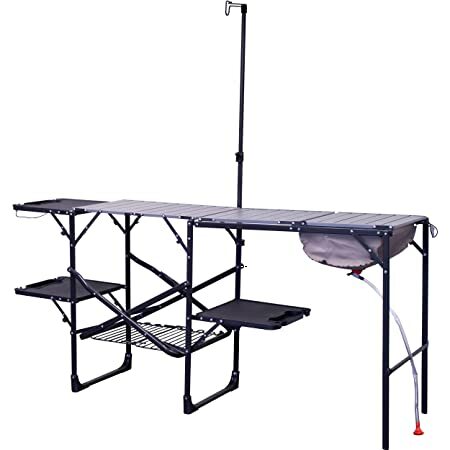 The GCI Outdoor Slim-Fold Cook Station Camping Table brings the kitchen outside for camping, picnics, tailgating, grilling, and outdoor parties. With space for a camp stove or grill, counter top surfaces for cookware and utensils, and dry good storage, it makes outdoor meal prep and cooking easy and convenient. The one-piece powder-coated steel frame easily unfolds, thanks to GCIs Slim-Fold technology, revealing an outdoor kitchen with an aluminum counter top, wire storage rack, and four plastic fold-out side tables. The heat-resistant aluminum counter top holds up to 48 pounds, and is the ideal space for a camp stove or grill. A lower wire rack holds up to 35 pounds for dry good storage. The four fold-out side tables hold 30 pounds each, and have beverage holders, stemware holders, a paper towel holder, and hooks to hold grilling tools and garbage bags. Easy to open, setup, and close, the GCI Outdoor Slim-Fold Cook Station Camping Kitchen folds flat for storage, and has convenience carry handles for portability. 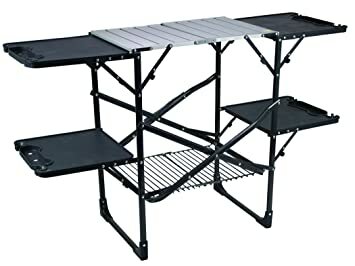 Outdoor collapsible table measures 20.9 x 52 x 32.3 inches open, 20.9 x 3.7 x 34.6 inches folded, and weighs 18.9 pounds. Limited lifetime warranty. The 3-Position Director’s Chair with Ottoman folds flat and compact with its patent-pending SLIM-FOLD design. The chair folds 40 smaller than same-style director’s chairs and features a three-position backrest for ultimate comfort. The plastic side table has a built-in beverage holder. And for maximum relaxation, we’ve included an ottoman. When it’s time to pack up, simply fold the chair up using our patent-pending EAZY-FOLD Technology and carry it with its carry handle. The ottoman fits in a convenient side pocket on the chair, while maintaining a slim design. The chair supports up to 250 lb (113.4 kg) and measures 21.75 x 24 x 38.25 in (55.25 x 61 x 97 cm) when open and 21.75 x 4 x 32.25 in (55.25 x 10 x 82 cm) when folded. Ideal for camping, RVing, picnics and watching sports. Patented BackComfort Technology holds the Wilderness Recliner backrest position at any angle while a lumbar cushion provides maximum comfort. Patented Auto-Fold Shoulder Strap Technology and backpack straps makes it easy to open, close and carry. Constructed of sturdy, powder-coated steel and 600 denier polyester, the Wilderness Recliner is ideal for camping, canoeing, watching sports or just about any outdoor activity. Features a storage pocket. Weighs only 9 lbs, yet it supports up to 300 lbs. Measures 17 x 25.5 x 31.5 when open. Folds to 28.5 x 25.75 x 4.25.